PRICE LOWERED... Call for more info ..... Gorgeous future studs..... Had all their final injections. Ready to go now. 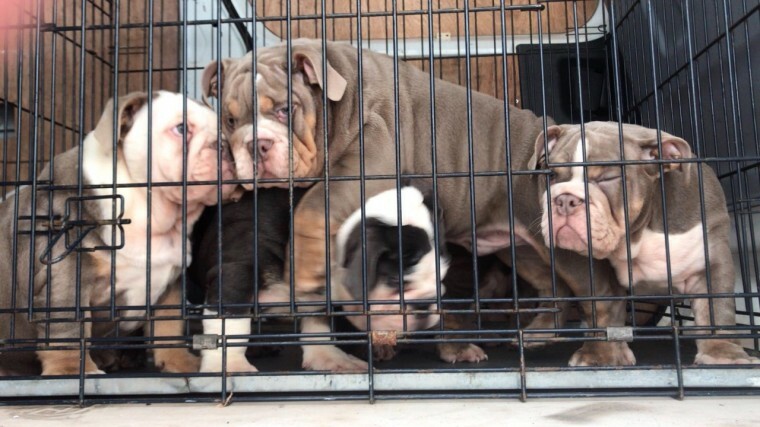 All photos are ONLY of the FINAL 4 LEFT... WHATSAPP OR IMESSAGE WE HAVE THOUSANDS OF GREAT VIDEOS OF THESE BEAUTIES..... We have a stunning litter of lilac tri..s and blue trindle English bulldogs . We have mother .lilac TRI. and grandmother can be seen on viewing the Mum to the pups is yorkshirebullyz lines followed back to epic bully..s lines. Sire to the pups is city bulldogs SNIPER .blue TRINDLE.. son of ace. The pups are amazing quality roped up short and compact. not like these long backed non true to type. They.e raised in a large pen in our living room. they.e used to all our household noises. and will leave with kc reg 1st vaccinations and microchipped and wormed to date and health checked and also a lifetime of support. You can see by the photos of these pups theyre nothing but quality. only 3 lilac tri boys available and 1 Blue Trindle. Prices start 3000 to 8000. Come from a litter of 9. For more photos and videos check out .yorkshirebullyz instagram. 2.2 Lilac Tri Girls SOLD 1.2 Blue Trindle Males SOLD 2.5 Lilac Tri Males SOLD 4 MALES LEFT.